Scheda: Nazione: USA - Produzione: Frank Lloyd Productions - Distribuzione: Associated First National Pictures, Universum Film A.G. - Soggetto: dal romanzo di Rafael Sabatini - Sceneggiatura: J. G. Hawks, Walter Anthony - Fotografia: Norbert F. Brodin - Montaggio: Edward M. Roskam - Art Direction: Fred Gabourie, Stephen Goosson - Costumi: Walter J. Israel - Musiche: Cecil Copping, Modest Altschuler, Robert Israel, John LeRoy Johnston - Formato: B.N., muto - Durata: 123'. Cast: Milton Sills, Enid Bennett, Lloyd Hughes, Wallace MacDonald, Marc McDermott, Wallace Beery, Frank Currier, Medea Radzina, William Collier jr., Lionel Belmore, Fred DeSilva, Hector V. Sarno, Albert Prisco. Plot Summary, Synopsis, Review: IMDb - entertainment.msn.com - nytimes.com - silentsaregolden.com - silentera.com - moviediva.com: «The silent version of The Sea Hawk is a faithful adaption of the Rafael Sabatini novel, which means it bears no resemblance to the 1940 Errol Flynn film of the same name. 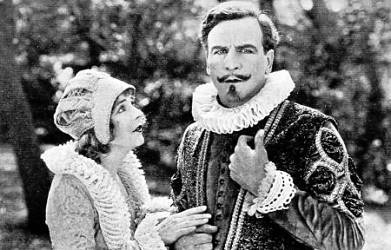 Sir Oliver Tressilian, one of Elizabeth I's gentleman pirates, has retired to his Cornwall estate and hopes to marry the dainty Rosamund Godolphin. 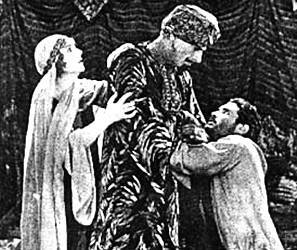 Sir Oliver's weakling half-brother Lionel carves up Rosamund's hot-headed brother in an impulsive duel. 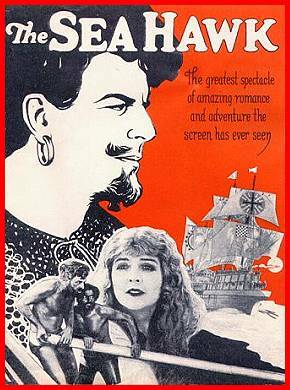 Lionel arranges for Sir Oliver to appear to have taken guilty flight, by hiring a rascally sea captain played by Wallace Beery to abduct him. Beery's ship is captured by a Spanish galleon and Sir Oliver is chained to the oars, "His body hardened by grueling toil became as tempered steel, his soul a cauldron of smoldering hate." 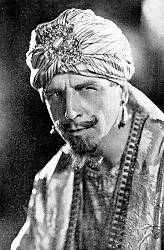 Then, the Spanish ship is captured by "the fighting Basha of Algiers." 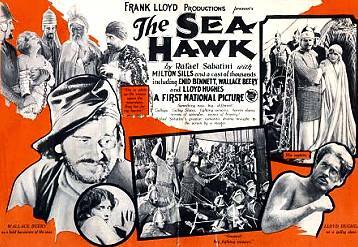 Disgusted by Christian's inhumanity to Christian and "ripened for Allah's service" he becomes Sakr-el-Bahr, The Sea Hawk...».